Indian ocean is half an ocean, hence the behavior of the North Indian Ocean Currents is different from that of Atlantic Ocean Currents or the Pacific Ocean Currents. Also, monsoon winds in Northern Indian ocean are peculiar to the region, which directly influence the ocean surface water movement [North Indian Ocean Currents]. 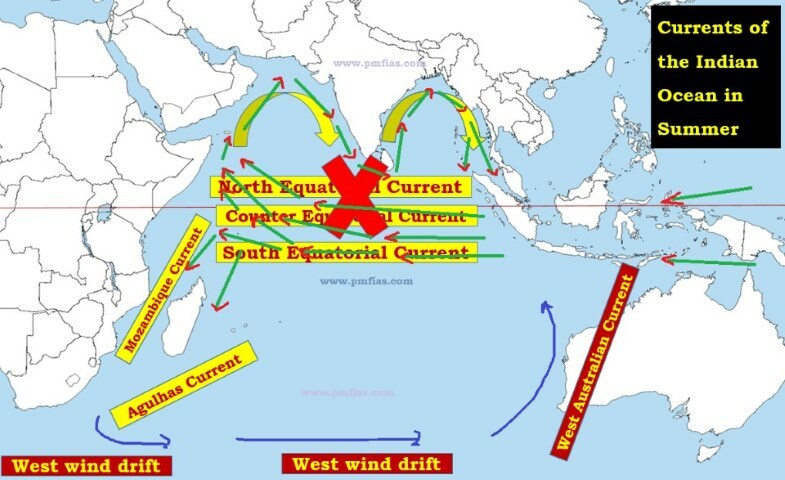 The currents in the northern portion of the Indian Ocean change their direction from season to season in response to the seasonal rhythm of the monsoons. The effect of winds is comparatively more pronounced in the Indian Ocean. 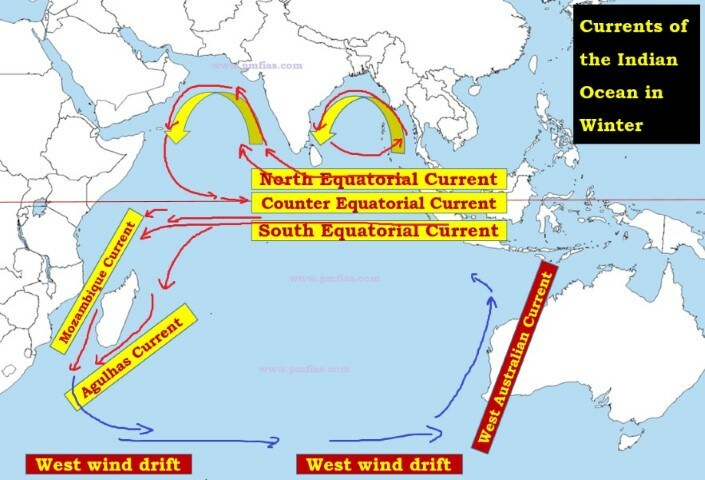 Under the influence of prevailing trade winds [easterly trade winds], the north equatorial current and the south equatorial current start from the south of Indonesian islands, moving from east to west. This raises the level of western Indian (south-east of horn of Africa) ocean by few centimeters. And this creates a counter-equatorial current which flows between the north equatorial current and the south equatorial current in west-east direction. The north-east monsoons drive the water along the coast of Bay of Bengal to circulate in an anti-clockwise direction. Similarly, the water along the coast of Arabian Sea also circulate in an anti-clockwise circulation. In summer, due to the effects of the strong south-west monsoon and the absence of the north-east trades, a strong current flows from west to east, which completely obliterates the north equatorial current. Hence, there is no counter-equatorial current as well. Thus, the circulation of water in the northern part of the ocean is clockwise during this season. The general pattern of circulation in southern part of the Indian Ocean is quite similar to that of southern Atlantic and Pacific oceans. It is less marked by the seasonal changes. The south equatorial current, partly led by the corresponding current of the Pacific Ocean, flows from east to west. It splits into two branches, one flowing to the east of Madagascar known as Agulhas current and the other between Mozambique and Western Madagascar coast known as Mozambique current. At the southern tip of Madagascar, these two branches mix and are commonly called as the Agulhas current. It still continues to be a warm current, till it merges with the West Wind Drift. The West Wind Drift, flowing across the ocean in the higher latitudes from west to east, reaches the southern tip of the west coast, of Australia. One of the branches of this cold current turns northwards along the west coast of Australia. This current, known as the West Australian current, flows northward to feed the south equatorial current.